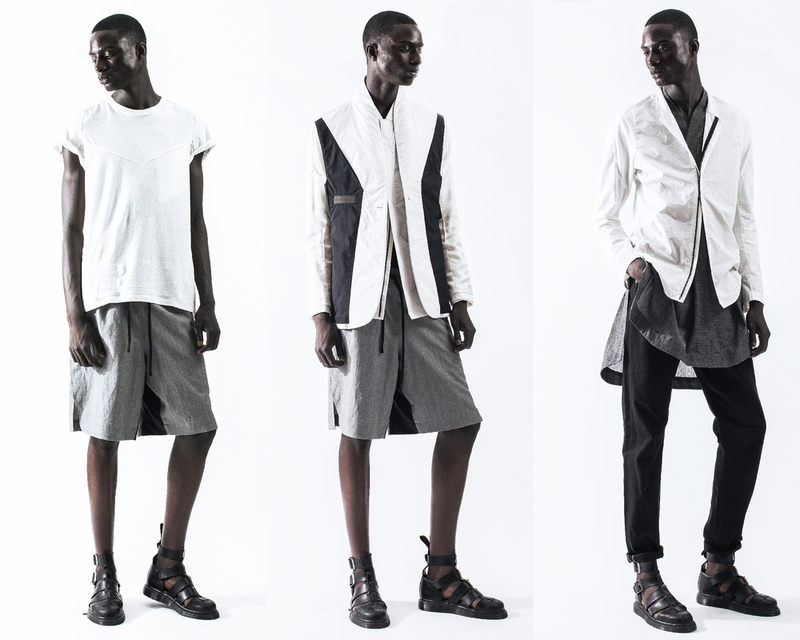 If you have ever ventured through the myriad menswear and street style blogs that have emerged in the last 5-10 years then odds are you have seen many pictures of Abdul Abasi. Tall, thin, and with his unmistakable top knot of dreads, he has certainly made his mark on the street style blogosphere (enough so that Complex Magazine voted him one of NYC's 50 most stylish). If you have dug even further into the world of menswear and fashion you may even know that Abdul is the shop manager of one of the most revered store's in the world- Nepenthes NYC. 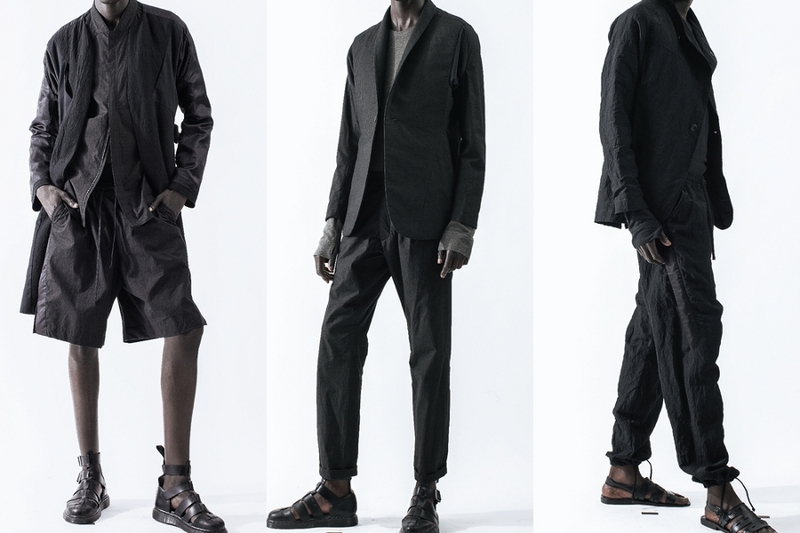 What you may not know is that Abdul is one half of the brand Abasi Rosborough which has evolved in the past few years to become one of fashions most interesting and unique new labels. After cutting his teeth with cult label's Patrick Ervell and Engineered Garments, Abdul joined forces with his current partner Greg Rosborough to form Abasi Rosborough. The aim was to shake up the menswear industry, introducing a new way of designing men's clothing that was firmly rooted in the experience of the modern, urban man. Most of Abdul and Greg's work seems to follow the modernist architectural mantra of form following function, and being able to render beauty through the process of reduction. With functionality at its core and a conscious desire to move away from the archetypical shapes and patterns of men's fashion, Abdul and Greg are designing pieces that function for the man of today. They are developing these new shapes in accordance with the evolving lifestyle of the modern urban man, but still maintaining the tradition of excellence in craft that comes with making all of their pieces in NYC. What's even more amazing, is that, like many young creatives, Abdul has been quietly building the brand all while he works his day job at Nepenthes. We catch up with Abdul to ask him about what inspires him to change the way we create clothing and what we should expect from our clothes, how Abasi Rosborough approaches their design process, where he sees his brand going, and how the hell he balances it all. You are going into your 4th collection with S/S 15. How would you assess the growth of your brand so far? Where do you want to be in the next 2 years? So far the growth has been organic, we've picked up a few stores here and there, and the awareness of what we are doing is spreading. So right now I think we're in a decent place. Obviously we are still working other jobs so we are not a total autonomous or self-sufficient company. But as far as our designs and aesthetics we're refining the process. The production process is getting better and the design process is getting more streamlined by using analytics to see what works and what doesn't work. Our vocabulary is getting larger, so I think we're moving at a nice pace and hopefully within the next two years we'll be even further along. More distribution, more stores, more of a story to tell, more of a lifestyle brand, having sportswear and opening more categories within what we do. You seem to drive your design process through addressing problems or flaws in functionality. How do you decide which problems to deal with and what pieces to design? What is your process for designing a new piece? Well essentially when we first started Greg and I proposed the idea of pushing men’s suiting forward. The model that we use now is antiquated, it was designed in the late 1800s on Saville Row. The use back then is totally different the use of a suit now. The reason why we started with the suit is because its archetypical garments that signify dignity, sophistication, strength, class, etc. So we started with something that everyone knew and decided how we could push it forward while still maintaining the same aesthetic. Design is problem solving, so Greg and I decided that for our first for way into fashion what we would do is tackle some of these problems. How come when you put on a suit jacket it always feels restrictive? How come when something is tailored it's also very stiff? We took elements of active wear such as knit panels, with consideration of the anatomy of the body and how muscles and ligaments move, and applied that to tailoring. Modern techniques with tried and true Saville Row tailoring and canvasing. Any time we conserve a product, it's trying to solve a problem or void that exists. When you start from that pure standpoint, it always guides you to something that has a reason. We strip away anything that is superfluous or unnecessary and we keep the essence of what it is so that it looks like a garment that you've already seen, but it always works and functions better. You and Greg have said in interviews that you have spent a lot of time working through prototypes and adjusting pieces until you reach the right response to a problem. This model for creation seems to be hard to adapt to the traditional fashion calendar where collections are released so quickly and consistently. Do you feel pressure to always be creating new pieces to fall in line with this format of seasonal collections? We wanted to ashu the whole seasonal calendar and that cyclical treadmill, but as a small company there is an issue of cash flow. The reason why there is so many seasons is because that means you can sell and you can buy and you can have this transference of money and this cash flow always coming through your company. We spent so long in development because we wanted to create a foundation, our own archetypes, our own blocks, our own patterns. Then based on that we would tweak it every season. At the core the collection is always based around tailoring. But now we are refining those aspects and expanding it into newer silhouettes, easier pieces and looking at sportswear and active wear, and putting our own take on it. Because we did so much ground work at the beginning it’s allowed us to stay with what we're doing and slowly iterate all of our processes. Although we are another seasonal brand, when you look at our collection you will always see the core, and then you will see some of the experiments that we do that revolve around the core and compliment what we do. It's never going to be a drastic change from season to season, but it is always going to iterate, refine, and get better. Whether it's out first collection, or tenth collection, all of the pieces will be able to be wore together and there won't be a drastic difference in what’s being made or created. Does this format also need to change? You have talked about creating a new paradigm with your clothing, do you think the entire industry needs to look at alternative ways of doing things? Can there really continue to be true innovation at the pace of the fashion industry as it is set up right now? I think what Greg and I realized in our short tenure as designers for our own company and for our history with other companies is that the only advantage fashion has in newness. That is the only reason fashion exists. Fashion, in itself, is not meant to be innovative, it is meant to create desire. The jacket you have in your closet works perfectly well, but my job as a fashion designer is to create something that makes you think that you don't need that jacket in your closet, you need my jacket. Innovation from fashion is probably not something on the forefront of most fashion designers minds but as we mentioned before, Greg and I look at what we do more as more product design. We are more attune to industrial design or architecture. We are taking codes and we're taking archetypes that already exist and we're pushing those forward. We're trying to create something that is timeless. The fashion industry revolves around a cyclical nature because it is about cash flow, creating desires, creating something that you want even though you don't necessarily need. It's a shame, but then again, it's a product of our society. If you go to H&M or Zara for instance, it looks like a zoo, things are thrown all over the ground, everything is 80% off and people really don't cherish what they buy. We have these fast fashion stores that allow people to buy things at an inexpensive cost to stay in fashion, and then after a few months, they can go back and buy something else and discard what they already have. It's a very wasteful way to do fashion, but at the end of the day materialism, capitalism, and commercialism are what reigns supreme in America and most first-world countries, at the end of the day. It's not a time where you buy one suit and wear it for twenty years, and you mend it when it is wore, then you continue to wear it. Now people are consuming as much as possible. It is about quantity, rather than quality. Unfortunately, Greg and I have to play in this playground, be a part of it, but we are trying to create a product made with integrity, a product made to last, and a product made to be timeless. At large, I don't fashion is going to change. I think it is going to continue the way it is going. Things happen in extremes, so I think it is going to go back to a time wear people bought a few staple pieces that were of higher quality and maybe cost a little bit more, but then they revolved the trendier pieces within their wardrobe to stay up to date, but the basics were always staple pieces. At AR, we hope to be those staple garments and if someone wants to dip their toe into a trend, that's fine. But they won't necessarily have to come to us for that trend. We are going to be there for the things that don't really change, just evolve. The nature of fashion in itself is to change, and it's very superfluous. At the end of the day, it's also exciting. That is why there is an emotional response when you see a dress or a jacket on a rack and you don't need that, you have one on your back that functions just fine. But you look at it and you need it and want it. There is something to be said about that desire and I'm not saying it is something that is irrelevant but the mindset of the customer and the mindset of society has to change before the wastefulness and consumerism subsides. There has to be a paradigm shift in the thinking. As an outsider looking in I would describe your process at Abasi Roborough as something closer to an architect or an industrial designer. Do you ever see yourselves producing work outside of fashion/clothing, and translating your ability to provide functional responses to problems to different mediums? Yeah, absolutely. Before Greg wanted to be a fashion designer, he wanted to be an architect. Personally, I've grown up all my life with drawing and design. I think that with creatives, it all comes from the same part of the brain. Whether you’re an architect, industrial designer, fashion designer, painter, etc., I think it's all the same. It's just a matter of applying it to a certain discipline. Greg and I do everything for AR. Everything as far as the photography, website, styling, PR, sales, and we quite enjoy it that way. It gives a congruence to our visual aesthetic and our design aesthetic. We want to create products that are better. I would love to work on other projects, and collaborate with people that may have more knowledge of the nuts and bolts of certain things, but could use a different viewpoint from another designer. People I grew up admiring are people like Syd Mead, Le Corbusier, and Jean Prouvé. These people were all self-taught designers, architects, furniture makers, etc. It's all from the same part of the brain and it all has the same basic foundation, as far as golden ratio and design that is considered from a basic geometry. This day and age everything is about specialization, but I think that if you really think about designers of the past it was more about the way you thought about the things rather than what they did. They came to each discipline with a thought process that informed what they created. I would to dabble in many things and I think that clothing and apparel is not the only thing that we will do. Hopefully in fifty years, when all is said and done, you may say AR did XYZ and that we tried a lot of things and brought newness and a new a thinking to many different mediums. If you could do any other job other than what you already do, what would it be? There are so many things. I'm completely into photography, but I’m also into art. I love using my hands to create things. Sculpture, painting, even products like industrial design would be really interesting or furniture design. I think the beauty about life is that you set your own limits. I don't class myself as anything but someone that is insatiably curious. I'm not a designer or an artist; I'm just curious about everything. If I feel the need to try something I'll do it and if it holds my attention I'll continue and if it doesn't I'll try something else. I love creating things myself using my own handwriting, so to speak, to create my own world. There's so many things I would like to do, I can't narrow it down. Who/what inspires you one daily basis? I'm not sure if I can pinpoint it to one thing. If anyone opens their eyes, there's something inspiring everywhere. You can be inspired by so many things if you are open to it. If you remove the context of what it is, and just look at it for the beauty of nature, the beauty of light, conversation, the way someone wears something, the way someone talks. There's so many things that you can be inspired from. I wouldn't necessarily say there is one thing or one person that inspires me, I think that being alive at this day and age, in this present form, and this present location is inspiring. It's all a matter of observation and opening your mind to see what's in front of you. When did you first know that you wanted to design clothes or create things? Well create things, since before I could even talk. Every kid has that sort of nack whether it's taking their building blocks and stacking them up or taking that crayon to the paper and scribbling. As human beings, it's innate for us to create and to shape our environment. In my formative years, when I was in high school I really looked at the possibilities of finding a career and I was always drawn to art and design. Initially I was probably more in tune with graphic design but, it wasn't until I moved to Europe that I really thought about clothing as a medium for expression and when I solidified my idea of being a fashion "designer". Complex has named you as one of NYC's 50 most stylish people and you are often photographed by the street style bloggers and photographers in NYC. How do feel about the entire street style culture? What has its impact been on fashion? People think that street-style photography or documentation is a new thing but people have been documenting the way of dress for centuries. If you look August Sander or National Geographic, it's just now due to the nature and democratization of the internet now everyone has the same voice and everyone has the same amount of power. Now you have the ability to shape your own personal brand and it's a beautiful time, but when everybody can do something there is a lot of rubbish and there's a lot of noise. Street-style in itself, at least in the third or fourth wave of The Sartorialist, when people were less self-aware, was a beautiful thing. It was really capturing an honesty and truth on how people actually dressed. Now-a-days people are dressing with the knowledge that they are going into an environment where they're going to photographed for certain publications. So they go out with that conception beforehand, which I think is inauthentic. Not to bash any of these, Pitti Uomo, street-style peacocks but, I'm a big fan of being yourself and being consistent and authentic. If you wear a three-piece suit every day in Idaho then if you go to Florence and you wear a three-piece suit that's great. But if you wear a t-shirt and jeans in Idaho but then when you go to Florence you are wearing a three-piece suit, I think there is something wrong about that. Anytime you dress up for a camera, I think it's a bit silly. Of course I'm flattered that I was chosen as the 50 most stylish men but I really take it with a grain of salt, because it's all a matter of taste, and I'm just being myself. Whether I would be photographed or not, that's the way I would dress. I urge everyone to dress with the consideration of being themselves, because I believe that confidence is the best accessory and the most import attribute to have when wearing clothes. When you are overly aware of what is going on, it loses the charm of what it is meant to be. I don't think street-style is going to continue but I don't think it is as pure as it once was. People are now dressing up for the camera and to create some sort of buzz or personal branding to market that, and I don't know if I'm a big fan. I think it's impacted it greatly. It's one thing for a designer to send something down the runway in certain style, but when you see it on the street it's a much fresher interpretation because it's mixed with high and low; it's mixed with older clothes and newer clothes and has a degree of function. People are wearing things because they need it to function in a certain weather or a certain climate. Street-style in its essence, when you compare it to runway is much more authentic and realistic. Designers send something down the runway in a certain style, and it is then interpenetrated by the audience in a different style in which a designer looks at, and then copies. Everyone is influenced by everyone else and everyone is looking. Whether it is the designer looking at the street-style photographer or the person being shot by the photographer is looking at the designer. I think it's beautiful because the community and the audience becomes one. Even Greg and I look at some of these blogs and some of the combinations are really fresh, some of them you may have never thought of. It becomes inspiration for us, as far how do we dress this or how would the modern man or woman wear their clothes in the wild. It's all useful information. As I mentioned before, the entire world is if inspiring if you open your eyes. Whether you garner this from a photograph or out in Times Square or SoHo and you see someone wearing something; if you open your eyes you will see something that will trigger something else. The internet in General has become an amazing platform for young independent brands. But it is also an extremely crowded market. How do you guys address this at AR? How do you approach the issue of standing out in the crowd? When everyone yells we whisper. I think that the cream always rises to the top. When you have a bunch of people making a lot of noise, that's what it becomes, noise. It is a beautiful democratic time, anyone and everyone can brand. Everything is valuable and everything is relevant but, I think for the discerning customer, they're always going to find like-minded individuals. AR doesn't scream. AR is very quiet. Ar is about quality, it's about design, it's about research. People that love quality, design, research, and consideration will find us. At the end of the day, you connect with like-minded people. What we do is authentic to ourselves. We only post things we believe are interesting. Everything we do is very authentic to us. Most of the people that have responded to us have been people that dig a bit deeper to find the interesting things, the things are not so known. It is a slower process, but I think it is also a more valuable process because the people and the followers that you do gain from this more considered approach, are the people that stay with you longer. The trend oriented, or the people that are hyped up become flash in the pans and they don't last. We're all about the slow burn, not the quick flame. Your brand has a very strong visual presence/identity. How do you approach and create the visuals for your brand? Do you guys create in-house? Yes, out of necessity Greg and I do everything. I have an interest in art and photography, so I kind of shape the visual identity of AR. It's a beautiful thing because it adds a congruency. Obviously, we design and make the product, but we also consider the way it is conveyed to the public. A lot goes into our photography. Of course it's not perfect or it's not the best or whatever, but I think it's very true to what we believe in. Ideally if we had the budget maybe we'd hire the Craig McDean’s or the Steven Meisel’s, but then again if we hired them it might look like every other Prada ad. So I think that by doing it ourselves we really create an original voice. Brands that we love, like Comme Des Garcons and Maison Martin Margiela, have a really strong visual identity that was very congruent to what they did as products. That's one thing that all lot of brands don't consider because everything is so compartmentalized. You have an art director from one firm to do one thing, and a photographer from another firm to do something else, and a graphic designer from one firm to do something else. They're all bringing their individual voices to something and the result is never congruent. But when you have art director, designer, and photographer all in one, or all in the same group, then everything they produce has a common thread and a common look to it and for us, we are happy to cultivate that. Both you and your partner at AR have built this brand while working at other jobs. What advice would you give to other creatives that are looking to boot strap a small business or creative endeavor in addition to working full time? With anything you have to put in the work and the hours. It's not like Greg and I wanted to do it this way. Ideally, we would have wanted to have investment or some sort of capital. There's a beauty in going through a struggle and embracing this obscurity. We still work our 9-5 and days and weekends we do AR. It's a passion project. It's something that we really believe in and as long as you have passion for it and if you’re willing to be poor or willing to eat Ramen or whatever the case maybe. If you are willing to sacrifice all of that, then it is not work to you. You have to believe that what you are doing is important and it will pay off in the future. It's not glamorous and a lot of people may give up or may not be able to make it through, but if you can make it through the hard times then when you get on your feet and when you do have that capital and that audience, you'll be so much more skillful with everything; with money, resources, production and you'll have a good grasp because you've done it all. It's a beautiful thing to go through struggle, as long as you are doing it from an honest place. When you're doing it from a place of passion and it's something that you really want to do, then the struggle is not too difficult. Not to sound cliché but if you have a dream to do something, you have to do it. But be willing to sacrifice for it and be willing to endure a certain amount of discomfort. If you put enough work into it, and if you believe in it and you have enough passion for it, it'll pay off in the future. Something that we believe fully at Metropolitan Society is that for a brand or product to be viable and successful it doesn't necessarily have to appeal to a wide variety of consumers or end users but it needs to connect deeply with a small and passionate audience who is able to buy into the identity your brand has created and the story your brand has told. What has been your experience thus far with AR? Do you think this is a valid ideology? What do you want people to know about AR? I would agree sincerely with what you say. There's almost 8 billion people on Earth, there is bound to some people that think the same way that you do, but everything isn't for everybody. You can't please everyone so you shouldn't try. The most important thing is to be true to yourself and to be true to your beliefs, and hope that there is other people that think the same, and that's what we are doing with a AR. We started this with the idea of changing the way clothes are made, pushing clothing and apparel design forward. Maybe it won't be done in our incarnation, maybe it will be done in a different way. But the conversation has started. With the influx of cell phone technology and tech design and things becoming small at the scale of computers and tablets, and phones getting smaller, quicker and having more storage. I feel as though this consideration hasn't yet been applied to clothing and the way clothing is made and that's what AR is trying to do. That's our legacy if anything else, it's just to push that forward as well. Not necessarily wearable tech or some sort of gizmo, or space-age suit. More about the blocks and the way that the fabric wraps around the body, gives and takes, and pushes and pulls. That is more so where we are coming from. It's not a matter of trying to make a product that every single person on Earth gets, understands, or wants. It's about making a product that is true and authentic, and that people that are like-minded also understand. When discussing the over-saturation of brands and digital age, I wouldn't say that any of them need to go away. It's like junk food. Sometimes you want something quick, sometimes you want fine-dining, and they are all relevant. I think it is all necessary and things will die and fall away at their own time. It's not a matter of trying to please everyone, it's trying to be true to yourself and hopefully having other people that are also into what you do. Eventually we'd love to do a brand, maybe supplemental line or something that is a bit more affordable, that allows other people to engage, or access what we do. But we are not trying to become the next Wal-Mart or Google, we're just make clothes that it better, work better, function better, and are timeless. Principles from early modernist architecture and thought seem to flow throughout your work with AR. Have you been influenced in the development of the brand by anyone or anything outside the world of fashion? I would say most of our influences have been outside of fashion. Fashion with a capital F, is kind of the enemy of what we do. It's superfluous, it's wasteful, but it is relevant because it does create desire. People want newness and beautiful things around them; they want an emotional response. But, when you try to make something that stands the test of time, you have to look outside of fashion. You have to look at architecture for instance. Structures are built to last of centuries and to house people; to be part of the landscape, but also to provide shelter and comfort. Those people have to design with more of a purity. When you look at the building blocks of design, you look at geometry. I'm a big fan geometry and of things that basically are the essence of what humans or nature is created by. So we look at industrial design, architecture, graphic design; we look at timeless design, thoughtful and considerate design. I think by employing those ideologies into what we do, and to apparel and to "fashion", we are able to have a more pure form of creation. You name it, we've probably looked them up. Off the top of our heads I think the whole Bauhaus movement, Max Bill, Dieter Rams has been a huge influence. Not necessarily for his product but for his ten rules of design and giving yourself a constrain and limitation. Also rules to live by when you create things. When you have that tension and that constraint, it forces you to get rid of all superfluous details, and to get down to the essence. A lot of Japanese and Eastern culture has had a large influence on me. We are big fans of Kenya Hara, Muji, and that whole aesthetic. But fashion designers also have been people we take influence from. I'm a huge Yohji fan as well. A lot of things that he does are very Romantic, but they also have a sense of timelessness. I remember he mentioned a photograph he saw by August Sander, there was a gypsy man who was wearing a suit, that may have been one or two sizes too big for him, but the way we wore it with such confidence and Romanticism, is something that Yohji always strives for. He designs a feeling or emotion into clothing, which is a timeless attribute. Anything that is timeless or pure, is what AR is inspired by. One of things we have noticed about your pieces is that they are beautiful on the inside. You took this one step further with your ARC Jacket/blazer which is reversible. What do you think the inside of a garment says about the brand/designer/creator? They say that beauty is only skin deep. In this Instagram world, everything is very 2-D and it's all about the shell or the outside, but true design is 3-D. It's 360°, it's inside its outside; it's detail specific. Everything we created was considered. We started the block from ground zero. The way we create our patterns and the way we fuse things together is done in the most impactful way so that we can create something that functions properly. When we create things it's all about the details disappearing so that the essence of the garment is all that remains. Although Greg and I are design nerds, if a person has no idea why the garment feels better, that's a better compliment to us. That all of that stuff falls away and they put the garment on and it feels better and works better; that's all we want people to notice. If you look at any of the design legends, its 3-D design, it's considered from the inside to the outside. If you look at the Guggenheim for instance, it was created from the inside to the outside. It's not all about the shell, it's about what lies beneath, and it's about everything working in harmony together. What was the most important thing you learned at either EG or Patrick Ervell in terms of either design or running a business? Both being very small companies, you learn to be very resourceful, to where many hats, to be able to multitask. You learn that it is possible. You don't need a million dollars to create something. If you have a great idea and you have the passion, you can actually do it on a smaller scale. With Patrick Ervell, it was pretty much him and I at some point and a lot of what designs goes on in his head. It wasn't really sketched out or there wasn't any mood boards or anything like that; it was very much in his head. Sometimes I admire that, to have a very concise idea of how you want to create something to the point that you don't even have to write it down or sketch it, it's in your brain. With Engineered Garments, Daiki is a great designer; his knowledge of clothing and clothing history is expansive and encyclopedic. He is someone that really taught me the Japanese way, which is very apprentice, master, sit back and watch, ask questions, learn, "not yet", maybe in a year, take your time, think about the soul and integrity of what you are doing. That is something that is really beautiful and really poetic, and I think it doesn't really exist in the Western world. Obviously, in Japan, when you go work for a company, you're normally in that company for life. They nurture not only the way you look at things, but the way you feel about the company. It's no longer a company, it's more like a family. It was a blessing to be there and it was blessing to see the inner workings of a brand like Engineered Garments, who had a humble start, but after a decade finally started to see some recognition, and at one point was one of the highest tattered in the menswear arena. These lessons have helped inform the way AR looks at the world. I think that whenever you work at a job, whether you hate it, or love it, there's something that you can gain, some reward, some sort of information or something you can gain from the experience, that you can take to your next job, or next endeavor. Those have been great looks at companies, and great experiences. I think they have informed the way that I look at AR, and I think there is a piece of them in what we do now. Whether it's through the way we think or the way we source items. People in your life leaves traces with you and as you move forward you always bring a part of them with what you do. With the time you have spent in retail at Nepenthes do you think that you are ready to take on a retail store for AR? If so, how involved would you want to be in design and selection of the space? Ideally it would great to open a store, but I think AR is not at a point where it is feasible. Being in retail, and my prior experience in that will defiantly inform the way I'd consider making a store. Because we are so hands on with everything, we have heavy amount of influence on the way it is designed and merchandised and conveyed to the public. Us being AR, we would defiantly consider, what is next as far a retail. Online retailing is blowing up. If you look at Sneaker boy and the way they approach retail; I would really love to think of a new way to present goods and to present an experience, and our shop a destination. We do have an online store, which is very cut and dry, very simple to navigate. A physical store with employee interaction, would be an ideal situation. Whether we get a space with a telly in the back and the store in the front, that remains to be seen; but we'd love present AR in a space completely created by AR, so you get the purest example of AR.